This economy package contains four 360 ml bottles of SoloCare AQUA multi-purpose solution. It is suitable for sensitive eyes and effectively cleans and stores all types of soft contact lenses. Its unique hydrolock technology keeps lenses moist and comfortable. 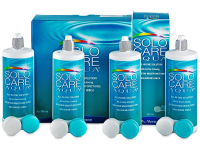 Solocare AQUA is a multi-purpose solution intended for cleaning, disinfecting, rinsing, moisturising and storing of all types of soft contact lenses. It effectively cleans lenses without rubbing them. SoloCare Aqua solution uses effective, well-tolerated cleaning ingredients, and is therefore suitable for sensitive eyes. This package contains four 360 ml bottles of solution and four antibacterial contact lens cases. 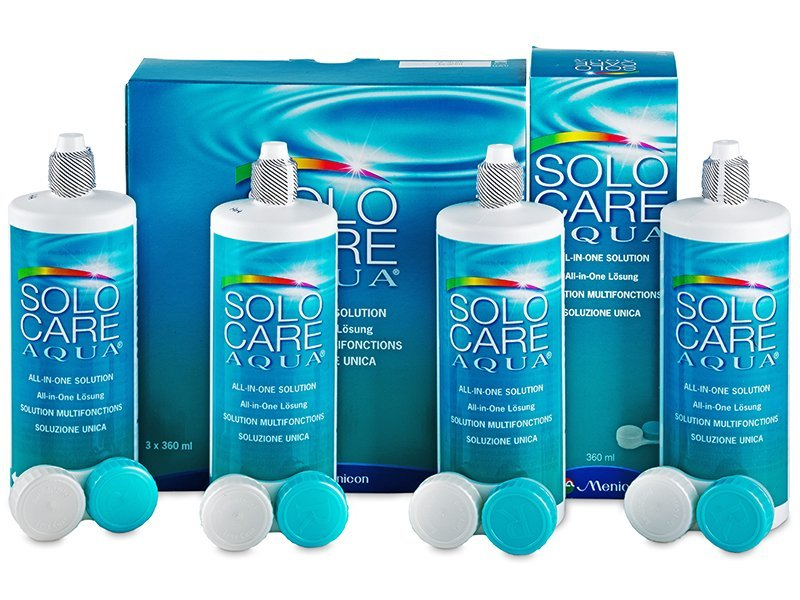 SoloCare Aqua solution is also available in smaller packages here. The unique hydrolock technology keeps contact lenses moist and provides greater comfort for contact lens wearers. Effective cleaning ingredients destroy harmful microorganisms. Each package of Solocare AQUA includes an antibacterial contact lens case, which prevents the entry of bacteria and keeps the lenses cleaner and fresher. Lenses can be stored using two cleaning methods. The first involves rubbing the lens in your palm with solution. Using this rubbing method, the lenses can then be stored in a case with solution for just 5 minutes before impurities are removed and it is safe to insert the lenses again. If the wearer does not rub the lenses before and after wearing, the lenses must be left to soak in solution for a minimum of 4 hours. Rubbing the lenses is the most effective way to remove impurities. SoloCare Aqua solution should be used within 3 months from first opening. Note: The Alcon company is no longer the owner of the license for the production and distribution of SoloCare Aqua. The license is now held by Menicon Holdings BV. This change has had no effect on the quality and the chemical properties of the solution.